This Coconut Cream Cake is a coconut lovers dream! It is a coconut infused cake, with a rich and creamy coconut cream cheese frosting, sprinkled with even more toasted coconut. You will be in coconut heaven with every bite. Coconut Cream Cake is probably one of the best cakes I have ever had. My husband whole heartedly agrees, he is always asking me to make it. The coconut cream cake itself is so rich and moist and the frosting is just to die for. You will love it! Please, don’t take my word for it.. if you love coconut.. you need to make this cake. This is one of our sister Elise’s amazing baking recipes. Elise is definitely the expert when it comes to cakes. This is a recipe you will want to keep on hand for special occasions, it is perfect for showers, birthdays, weddings, and having company over. We have even made it for Easter and dressed it up like a bunny. It is also a really good dessert for Hawaiian themed parties. But more often than not I like to make this cake for no reason at all other than I love this coconut cake. IF YOU HAVE NEVER MADE THIS CAKE BEFORE BE SURE TO READ! This is one of our more advanced recipes on our site but well worth the work! We have made this countless times and it will turn out great as long as you carefully follow the instructions and don’t skip steps. This cake requires freezing OVERNIGHT so be sure to make it a DAY AHEAD of when you plan to serve it! This is a very moist cake and the freezing of the cake makes it so it will not crumble when it is frosted then next day. This step is very important if you want to keep your cake looking pretty. I have had a few comments with people saying they had issues with sticking… be sure to grease and flour! If you are worried about it.. grease your pan, then line the bottom and sides with parchment paper (so it doesn’t slip) cut a round piece of parchment paper for the bottom and a long strip for the side of the pan. Then grease again over the parchment paper and lightly flour. Some people have had issues with the cake overflowing in 2 pans, I’m not sure if this is an elevation issue or an over beating issue with the batter, but if the batter seems to be filling your pans more than 3/4 full, consider using a 3rd pan or reserving some of the batter for some cupcakes. One person mentioned that she just made it in a traditional 9×13 inch pan without doing the layers and it turned out great. Another reader just did cupcakes and said that they turned out really good. With either of these options you will need to adjust your baking times accordingly and really watch it close by doing toothpick tests. The cupcakes should cook much faster so start checking those sooner. This Coconut Cream Cake is a coconut lovers dream! It is a coconut cake, with a rich coconut cream cheese frosting, sprinkled with toasted coconut. Separate eggs, set whites aside. Beat wet ingredients together including egg yolks until fluffy. Sift dry ingredients together and stir well. Add dry ingredients to wet using mixer on low speed alternating with buttermilk/extract mixture. In a clean bowl, beat egg whites with a pinch of salt until stiff. Fold egg whites into batter. Bake at 275 degrees for about 90 minutes (this cake comes out much nicer when cooked at a lower temperature). After about 60 minutes, do the "toothpick test", repeating every 5-10 min or so until the toothpick comes out clean. After the cake is out of the oven and transferred to parchment paper or a cooling rack, poke each cake with a few holes (making sure not to poke all the way through) and drizzle another 1/2 cup of coconut cream over the top. This keeps the cake extra moist. After the cake completely cools, gently cover it with some plastic wrap and transfer to the freezer to freeze overnight. The next day, frost immediately after removing from the freezer (see frosting recipe below). This keeps the cake from crumbling while it is being frosted. Put a layer of frosting in-between the two cakes and then continue to frost the remainder of the cake. After frosting, sprinkle the cake with toasted coconut (instructions for toasting are below). Allow the cake to thaw for about an hour before serving. Beat butter, cream cheese, and coconut extract together, adding powdered sugar little by little until reaching desired consistency. If it seems to get too stiff, add about 1 tsp of milk at a time until you get the consistency you want (add milk to thin it out, add powdered sugar to thicken it up). Place contents of about 1/2 bag of sweetened, shredded coconut on a cookie sheet. Spread it out so it makes just a single layer. Some pieces will still be white and soft, some browned slightly with a little crunch. *The preparation time does not include freezing the cake overnight before frosting. Make this cake the day before you plan to serve it. More Recipes for Coconut Lovers! Tasty Coconut Cupcakes – Light and fluffy cupcakes with the most amazing coconut frosting! Coconut Cream Pie from Scratch – No pudding mixes in this delicious coconut cream pie filling. It is a creamy, dreamy pie! Coconut Pecan Cookie Bars – A graham cracker crust topped with coconut, milk chocolate chips, pecans. An easy recipe that everyone loves! Caribbean Coconut Fudge Bars – A soft oatmeal cookie crust topped with chocolate fudge and a gooey coconut topping. The recipe comes from a coffee shop in the Caribbean. Coconut Almond Bread – This is a moist coconut bread with a hint of almond. Perfect for breakfast, dessert, or a sweet treat. OOh…we ate some at Erica's house last night. Delish. I'm not a huge coconut fan and I kept wanting another bite! Sooo good! Is powdered sugar the same as icing sugar and how many cups is in “a bag”? Icing sugar and powdered sugar are the same thing – they are both sugar processed into a fine powder. I think different countries and regions call it by different names. There are 3 3/4 cups powdered sugar in a 1 lb. bag, 7 1/2 cups powdered sugar in a 2 lb. bag. Thank you for your question! So which sized bag is this recipe calling for? I would assume the smaller? It is a 2 Lbs bag of powdered sugar. You may or may not use all of it. Powder sugar means when u grind the sugar (like in coffee grinder &powder it. It’s not the same thing never. Can this be baked in a 9 x 13 inch pan and if so, what would the baking time be? This looks so yummy! Yes, it can be done in a 9×13 pan.. you might just have to take out a little batter so it doesn't overflow. Maybe save the extra batter for a couple cupcakes? I haven't done it in a 9×13.. maybe just bake for an hour and then keep doing the toothpick test every 5-10 minutes or so until it comes out clean. Oh. my. goodness. I want this now! I'm assuming that the optional 1/2 c. coconut cream drizzled over the cake is in addition to the 1 c. that is mixed into the batter? I just want to make sure I've got it right. So excited to try this! I had a real problem with the cake sticking in the pan. Next time I think I would flour the pan. Or just use a lot more Pam. @ ME again – – what helps is if you use the actual baking spray.. it is the kind that has flour in it. That is what I like to use any time I bake and it seems to help with the sticking. If that doesn't seem to work, maybe like you said, just coat it with a little more flour. Can I get a clarification? Are you to frost the cake immediately after taking it out of the freezer? I'm about to make the cake and this part had me concerned. @ Sarah– Yes, frost it right out of the freezer. It won't crumble as much when you are putting the frosting on. You won't get those little annoying crumbles throughout the white frosting (I hate when that happens)! I also had problems with the cake sticking to the pan. I even floured the pan. Not sure what more I could have done. Was able to save it so it will still work. Got to taste some and it's yummy so far! The top was a very dark golden and almost crusty consistency. Normal? Not sure but I'm sure with the cream of coconut going on top and the frosting it will soften up. Coconut cake is one of my favorites and this recipe sounds perfect and very doable. I love that it uses buttermilk, too! I will save this recipe…pictures look great, too! Since some of you are having difficulty with the sticking, I recommend lining the bottom of the pans with parchment paper. When my cakes stick with or without flour this always does the trick. I put that in the recipe just so hopefully no one else will have sticking problems! This was a hit at my potluck dinner tonight! It was so yummy!! It's rich and sweet. You can only have a little at a time but it's so good. I'm waiting right now to have my second piece. Trying to hold back. Ha! Ha! Made this cake this week – Best. Cake. Ever! Am making it again for family Sunday dinner gathering. Super moist, frosting is just right. Thank you! What a delicious cake. I love anything coconut and especially coconut cake. It looks divine! love, love….fall baking time….have a moment. did u cut the 9×13 cake in half and frost inside too? or just all over the outside? So I decided to make this tonight to take to a dinner tomorrow we were invited to. I folllowed the directions EXACTLY! and used 2 9 inch round pans. They overflowed in my oven and made a HUGE mess! I also put parchment paper in the bottom of the pans as directed, but because the cake puffed up so much I can see that the sides are going to totally stick. Ahhhhhh! SO FRUSTRATING! Mine is overflowing as I write this 🙁 :(. I used 9 inch pans too! Hoping I can salvage something since its for a birthday today. I’m so sad. We are so sorry for the confusion in this recipe. We have updated it so that only 1/2 cup of coconut milk goes into the cake mix and 1/2 cup is drizzled over the top. This should stop it from running over. Mine also ran over my 9″ cake pans. Fortunately I put a cookie sheet on the rack below the cake and it caught most of the overflow. Next time I will try 3 nine inch pans and just have thinner layers. Also the cook time took one hour and 45 minutes. Still can’t wait to try it. We are so sorry for the confusion in this recipe. We have updated it so that only 1/2 cup of coconut milk goes into the cake mix and 1/2 cup is drizzled over the top. This should stop it from running over. Thanks for being willing to try it again! It really is a great cake. Still says 1C coconut cream in the cake mix… Is this correct? If I only ad 1/2 should the recipe be altered in any other way? People have been having issues with the cake overflowing so to solve that we said 1/2 c. in the cake, 1/2 c. over the top. When you buy the can of cream of coconut there will usually be more than a cups worth in it so you would use 1 cup of the cream of coconut in the cake itself and whatever is leftover from the can you would put over the top. Hope this helps! I don't know what to say! I haven't had this happen yet and I have made it at least 3 times! I don't know if it is the elevation you are at or what.. I guess I would suggest just filling the cake pans less? Or set the timer for less time and see if it is puffing up too much? I don't know! I am so sorry! In the 4th sentence after you combine the wet and dry ingredients… “Add dry ingredients to wet using mixer on low speed alternating with buttermilk/extract mixture” — you mix the buttermilk and extract together and add it a little at a time to the mix. Sorry, how it is worded is a little confusing! why are we freezing the cake overnight? In my experience it makes the cake more moist! It also makes it easier to cut, assemble, and frost without getting little crumbs in the frosting. Please help me with the recipe of carmel cake. I cannot find it and it looked soooo good. Thank you. @Sandy- Wow, what a nice comment!!!! I am so glad that you liked the cake. I love the idea of using the green-colored coconut and jellybeans to make it Easter-y. We will have to do that next year! Thanks for the suggestion! found your recipe while searching for coconut cream cheese frosting; I used the Duncan Hines Coconut Supreme Cake mix and used your frosting recipe….it was great!!!! I didn’t have the coconut extract so I used 1/2 vanilla and 1/2 almond extract and it worked out just fine. I only wish I had found this recipe before I bought the cake mix. Next time I will try the whole thing!!! I made this cake this weekend for my daughter’s birthday–it was AWESOME! I used parchment paper on the bottom of the pan and sprayed the sides –no problems. The worst thing about this cake is that it is sooooo good! I am a little confused with the parchment paper direction. would you mind telling me a step by step on how to line the pan with parchment paper? what i am thinking of is seems very tricky, but i would like to know how you did it! Cut a circle in the parchment the same size as the bottom of your cake pan.. then make a strip out of the parchment to wrap around the inside. That’s it! Really easy! so the strip of parchment, not the circle is for the sides? thank you so much! i am looking forward to making this cake! Is the buttermilk a necessity? or can you replace it with something else? or just do the regular milk with some lemon juice for a minute or two? I have always used buttermilk.. any substitutions aren’t guaranteed to turn out EXACTLY the same as the original recipe but you can sure try it! I would like to make this cake today but I don’t have any coconut flavoring. Have you ever made this with out it? Can I subsitute anything and still get a great flavor? I have never used anything but coconut flavoring. The coconut flavoring is probably the best to use. You can try a different flavor but I can’t promise it will taste as good! What kind of flour do you use for this? Cake flour? Just want to make sure I get it right. Thanks! Nope! Just regular ole white flour! Yes, 2 1/2 cups flour. Thanks for catching that! I just fixed it. Great recipe! Can I use for cupcakes? Time and temperature? Made precisely as written, this cake was very tasty, however it did somewhat overflow my 9″ round cake pans even though I measured carefully and am at a normal elevation. I found the icing recipe a bit scant for the layer cake version and would do 1.5x the recipe next time. Overall the recipe is fairly complex and time consuming, taking at least two days, a stand mixer, a hand mixer, 6 bowls, a cookie sheet, the two cake pans, a lot of spare room in the freezer, etc. … but the end result is very tasty. Will try again as a 9×13 instead of layers. Don’t skip the soaking of coco lopez on the finished cake, I think that is what makes this cake really stand out. Thank you for a very good recipe! Also… I sprayed my cake pans with Pam, then used parchment paper on the bottoms only, and sprayed the parchment paper and sides with Baker’s Secret and had no sticking issues at all, even with the overflow. Would you mind telling me how you wrap cake in freezer overnight? Should I put in a freezer bag? Thanks, can’t wait to attempt this! You let it cool and wrap it in plastic wrap. I like to go even further and put it in a plastic bag as well! Had to update…served this to a crowd today and everyone was raving!!! It is an amazing recipe that Ill definitely be making again. Thank you! I’m back and getting ready to make this cake for a second time because people have requested it from me. I’m excited! I’m going to do the parchment this time to help with the cake coming out cleaner. I had thought about making them into cupcakes, not sure how that would work though. I’m going to an adult/couples Valentine’s party tomorrow night and bringing it. So excited! When you say a bag of powdered sugar do you mean one or two pounds? I made this into 12 jumbo cupcakes tonight. The cupcakes were moist and delicious, can’t wait to make it again. Thank you! Have you ever made this with gluten free flour? No, I’m sorry, I have no idea how that would turn out. It is cream of coconut.. you can usually find it near the mixers in the alcoholic beverage section of your store. It is non-alcoholic but that is where you will find it. I have never substituted it for anything else. I’m putting this recipe on the top of my “Must Try” list! I love anything coconut so this should be a winner……can’t wait to try it! This cake was delicious! I made it in a 9×13 glass pan with no overflow problems. Don’t wait for Easter or a special occasion to make this. My family thanks you! I haven’t. The frosting tastes best when it is fresh. If I am taking it somewhere I usually freeze the cake and refrigerate the frosting… then before serving I frost it. Hi I made the cake and froze it after I frosted it 2 weeks before the party. It was wonderful and everybody raved!! BIG hit Thanks for the recipe. Hi! I am making this cake today for Christmas dinner! I am so excited 🙂 The cakes are in the oven now. I actually did 3-9″ cake pans after reading some comments. After frosting the cake tomorrow should I keep it in the fridge? I need to frost it several hours before we eat it. Thank and Merry Christmas!! I am assuming you already made this cake but you don’t need to keep it in the fridge if it is just for a few hours before serving. It is great at room-temp! You might want to try a lower temperature.. what elevation are you at? Sea level – I think I may have overbeaten the batter? WONDERFUL recipe! The cupcakes were a huge hit! If you make this cake in a 9 x 13 pan, do you still remove the cake from pan after cooking and freeze or can you go ahead with the next step in the instructions. Love all your recipes and ideas! If you make this cake in a 9 x 13 pan, do you still remove the cooked cake from the pan and freeze ? Also, if you do not freeze cake, do you remove the cake from the pan or can you leave cooked cake in pan and follow next step? Thanks!!! The cake always turns out better when I freeze it. If not freezing, I would still remove. also the weights of store bought ingredients in the uk are different from the u.s and just wondered what size your bag of poswered sugar is, perhaps 1 lbs i am guessing? Many thanks and sorry for the bother. Yypically the bags of powdered sugar are 1 or 2 Lbs here in the U.S.
First of all, happy birthday!!!! You could probably get away with refrigerating it but it is the best frozen. When you freeze it, just be sure to wrap it up really well so it doesn’t get too much frost on it. 🙂 Hope your birthday is a great one! Let me know how it turns out! i would like to know what do you mean by c. is that a cup? and how much is a cup? also i would like to know if i can use any kind of flour because of gluten intolerance. Yes, c. stands for cup, which is 8 oz. As far as the flour, I would use a gluten free flour that is recommended for baking. I can’t guarantee how it will turn out because I have never tried it this way. If I use White Lilly flour do I omit the baking powder and salt from recipe? I’m not exactly sure how Lily White flour works… I haven’t ever tried it that way so I don’t know what to suggest. Let me know if you try it and how it turns out! Hi! Where does the toasted coconut fall into the recipe? How much should I use? Thanks for asking Amanda! The directions for the toasted coconut can be found at the very bottom of the instructions. Place contents of about 1/2 bag of sweetened, shredded coconut on a cookie sheet. Spread it out so it makes just a single layer. Bake for appx. 8-10 minutes in a 325-degree oven. Some pieces will still be white and soft, some browned slightly with a little crunch. You are going to love this cake! I made this cake for a co-workers birthday yesterday and everyone LOVED it! It was such a hit that I am making it again for family this weekend. Like another poster, I too made extra icing. When I assembled the cake on the cake plate I placed a thin layer of icing on the plate around the base of the cake and sprinkled toasted coconut on it as well as on the top of the cake. Thank you for posting this recipe! I am sure you can and I bet it would be delicious– I haven’t tried it though so I don’t know what to suggest! If you try it, let us know how it turns out and how much you used! i was wondering will this still taste good if i dont toast the coconut? thanks!! It will still taste good – you can’t go wrong with coconut toasted or not! The toasted coconut just gives it a nice look and a crunchier texture. How can make this cake in a microwave? What would the time require be? I have never used the microwave to bake a cake. Check the directions on your microwave manual or do a search online for the best options. First time baking a cake. Found this recipe on pinterest, connected me here, and it was wonderful! Your directions were so concise and clear for a cake baking newbie like me! People couldn’t stop raving about it. It was so moist and delicious! A definite repeat and saved recipe. Thank you!! Are there any changes for high altitude for this recipe? if so, what? Hi Michele, please see the link below. There are great tips for adjusting a recipe for high altitude baking. I am going to add this to the recipe on our site for anyone else baking this cake at a high altitude. Thank you for asking! I made this cake and the center did not rise, followed directions to a “T” any suggestions. also it was done within an hour, I am at 9500 feet, does the recipe need altering? I can’t wait to try this for Easter. For your cream cheese frosting, did you use a 1 or 2 lb “bag of powdered sugar”? I tried to read through the comments but didn’t see an answer. Thanks! It is a 2 lb bag of powdered sugar. Thank you for asking! I will change it on the recipe. It takes a lot of frosting for the filling and to cover the cake. Hello, I am not sure what flour you use. Would that be unbleached All Purpose Flour? Yes, I use unbleached all-purpose flour. Thank you for asking! We haven’t tried it that way before… let us know if you try it and how it turns out! I would like to make this a day ahead of a club meeting at my home. freeze, frost and refrigerate? or back to freezer? how long should i let it sit out before cutting and serving from freezer or fridge. or just cut and serve form refrigerator. thanks. It only needs to be frozen once. Freeze, frost and refrigerate. Let it thaw for about an hour. It thaws pretty quick. Wow! That’s quite a compliment! I’m so glad you liked the recipe! I made this for my husband’s birthday today and it is AMAZING. Your instructions are good and I used 3 small pans to make a 3 layer cake. No overflow and no sticking. I used parchment circles but not on the sides. Just heavily buttered and floured. They popped right out – of the cheap foil pans too!!! I didn’t toast the coconut and added raspberry jam to the layers. It is a great frosting too. I doubled it with a 2 lb bag of conf sugar and it was the perfect amount. I will be sharing! My go to coconut cake now! Thank you!!!!!! Thank you so much!!! Sometimes cheap foil pans work just as well as expensive ones! So glad that you liked this recipe. It is one of our very favorites! I am having trouble finding coconut extract. Any suggestions where I can get it besides on-line? I did find imitation coconut extract from McCormick. What are your thoughts? 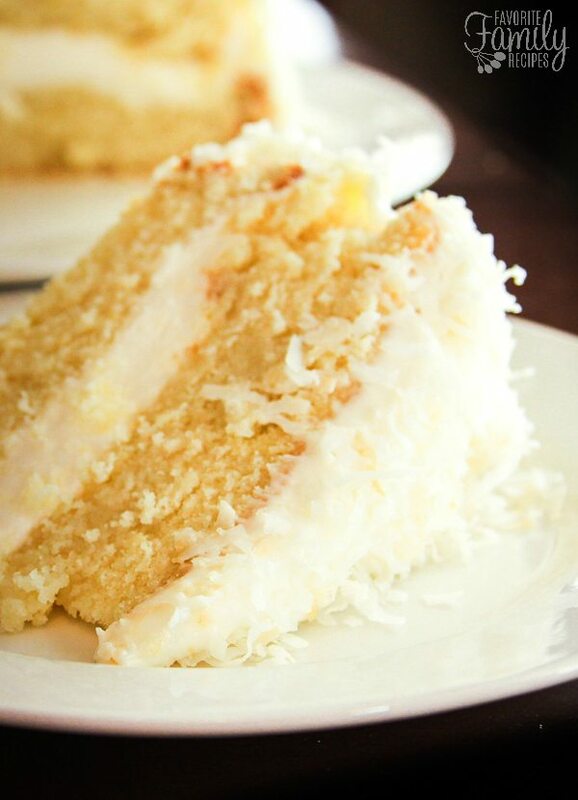 This is the BEST coconut cake recipe ever! I have made this cake at least 6 times since finding this recipe last year. Thank you for this! Question: I want to make these into cupcakes for the first time tonight. Do you have to adjust the baking temperature? What about the cooking time? I would love help if modifications needed if you have done these for cupcakes? Also, did you freeze the cupcakes overnight like you do for the cake recipe, and then frost the next day? I haven’t made cupcakes before with this recipe but you would definitely want to adjust the baking time.. maybe check after 15-18 minutes and every 5 minutes after that? Also, it wouldn’t hurt to freeze them! I probably would if it were me. Let me know how they turn out! Can you tell the aproximate number of servings please? I would say about 16 servings depending on the size of slices you do (if you want to do smaller servings you could probably get 18 slices). Hope this helps! I made this cake for just me because I love coconut and coconut creme. My hubby hates cake and does not eat it. As I was enjoying and having the best cake in my entire life he wanted to know what I was eating. I told him and I also told him he could not have any because I knew he wouldn’t like it so I didn’t want even a piece wasted on him. Between the two of us I knew he would love it, this was my way of forcing him to taste it. As he came closer to look at it he told me he would try a piece so I gave him a few crumbs knowing he just had to have more. He didn’t want anymore because after all he doesn’t like cake. Later on into the day I heard him in the frig. digging around. I knew what he what he was doing. I tripped lightly behind him and asked “What’s in your mouth?” His response, ” Nothing, okay it’s the one and only cake you will ever see me eat? This is fantastic, can I have more?” My response, “NO!” Of course I let Tony have another slice and another and another. This cake is the best cake I ever made and ever ate. In fact I wouldn’t even call it a cake, I think of it more as candy that’s how wonderful it is. I can’t wait to make it for company or a party. Keep up the good work! BTW, didn’t read the note about 3 pans. I thought it looked like a little too much. Good thing I had two cans of Easy Off in my Pantry now it’s in the oven! Can I make the frosting the day I make the cake to save time? Yes. That is totally fine. Just refrigerate the frosting after making it and then bring it to room temp before frosting so it spreads easier. Hope this helps!